Time for an "actual play" podcast. 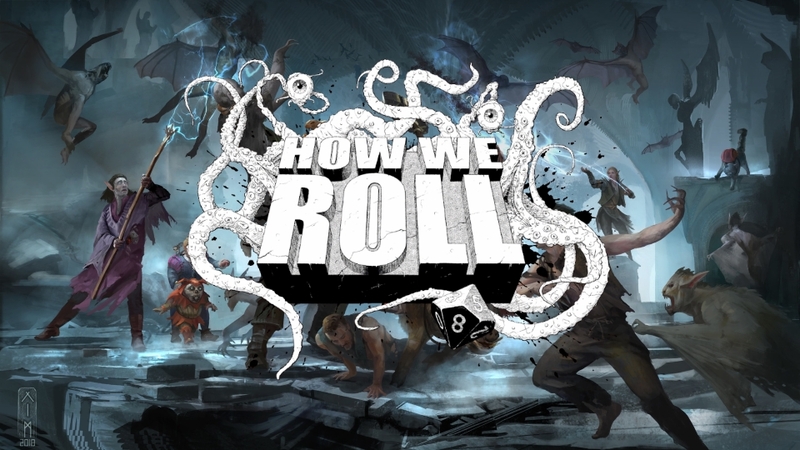 For those who aren't aware what that is, it's a group of tabletop RPG players, gaming through a campaign, and recording it all for an audience. Like all player groups, style can vary significantly, due to either the players or gaming system being featured. There's also a sliding scale of how much post-editing a show will get, to add in sound effects, eliminate quiet moments and provide suitable background music to set the scene. I haven't actually listened to one of these for quite a long time, having mostly switched over to scripted audio drama, but I did listen to a hell of a lot of the World's Largest Dungeon Podcast a few (too many) years back. And as an interesting side note, there's been a slight bit of shouting on Twitter recently about whether or not actual plays count as audio drama. Bit silly really. Anyway, back to this particular one. I did try jumping in to the most recent series, but I quickly discovered there was a lot of plot behind it all. Decided then, to go back to the start of the podcast and have a listen forward. I think there's also possibly about six or seven different campaigns tied into the single RSS feed, both Call of Cthulhu and Dungeons & Dragons, so going back to the start allowed me to pin down my listening to just the main Cthulhu thread. So, in this wild bunch of mad players, what characters have we got? From the very start, there's: the skeptical Reverend Royce; Spencer Randall, Private Eye; Bartholomew Omond, mostly rich, and famous actor, Harold Mudd. Different characters drop in and out as various horrible things happen to our core cast, and of course a wide variety of NPCs, voiced by the surprisingly versatile (if occasionally strained) DM. They all wander through the world, investigating occult happenings and attempting to put down hideous monsters that are too fond of using people as the snack they can eat between meals. Since Call of Cthulhu is a fairly role-playing heavy game, that features some rather brutal sanity and luck aspects (it is far too easy to lose both of them), this tends to result in the "heroes" ending up in very sticky situations. In one session they might dig up a zombie corpse, go slightly blind, and try to stab everything around them. Alternatively, having passed into a hidden lizardy realm, they might go mad from the revelation and decide the best plan is to murder the mad fool who led them here. It's obviously mostly an improv work, with the character voices dropping in and out as the players either amuse themselves too much, or get caught in metagame conversations about the best plan of action. It's an interesting insight into their playing style, and means that it has a very different feel to the scripted works I usually prefer, where someone always knows what's going to happen. Even the DM isn't entirely sure, with the random nature of die rolls allowing the game to go completely off the rails unexpectedly. This is both good and bad. It's a nice change to my normal (especially since I've never RPG'ed in any great depth), but I don't see myself being able to listen to more than one series like this at a time. You need to be able to track the players and characters independently to fully work out what's going on, and it can sometimes get a bit overwhelming, particularly if players have unfortunately similar voices. The other issue I can see is the out of character moments with the players just chatting, can get a bit annoying. Friends having fun aren't necessarily laser-focused on the needs of theatre, and while the DM is pretty good at explaining important game elements subtly, the impact of climactic moments can be lost in the joking about. It was a listen due to the PodUK thing, but I think I'll probably stick with it. The early episodes are definitely rough, both in terms of gaming and the technological aspects (they're playing from different locations, and so the unreliability of skype etc is a factor), but I'm invested enough to give it some time to improve. The stories they're telling are compelling, and the fun factor of them slowly going mad is significant.